encountered while drawing complex facial features - namely lips and mouth. her drawings so all of us may benefit. do the originals justice - I had to shrink the files before I sent them out. there where the two touch - are the hardest, i.e. darkest lines of the lips. definable as a group of shapes or shadows - rather than single lines. Look at the second picture (just below), - it's the larger lip picture. With your eye, follow your way all the way around the outline of the lips. each segment is probably a combination of 3 or 4 light lines. beautifully. 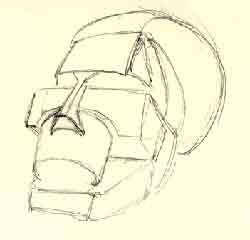 The lines are more of an impression that when perceived as a whole by the viewer look real. The "impression" I'm talking about is the recording in pencil of what you, the artist observed with your eye. Shadows on curved surfaces, like the lip, drawn as blended shapes are easily interpreted by the eye. "Blended" just means a gradual gradation of value from light to dark. realistic picture of complicated features if you blend shadow and line. Cross-hatching is an excellent way to pile up lines for shadow shapes. it's actually easier to draw the lower lip by default. How do you do that? 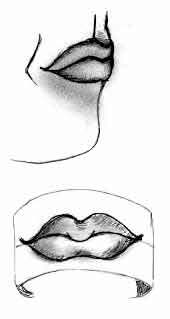 By drawing the shadow shape of the shadow underneath the lower lip. blending of shadow shapes for the softer edges. Excellent start Suzy! border". 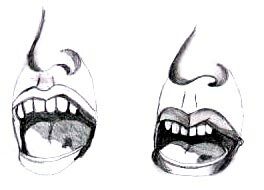 This is outlined in more detail in the Lesson 13 on Lips and Teeth). 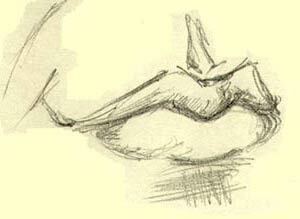 Assignment #2: Don't be afraid to draw lots of lips! Trace 10 or 12 of them. nothing but lips. They will come. the lower half, try and re-create the shape with nothing but cross-hatching. Use more layers of hatching where the pencil lead is thicker. tongue's shaped. I certainly get the full three-d effect here. in stuffy academic circles as the "booger canal") curves into the upper lip. problem in a three quarter view is keeping the proportion and the "planes"
Ok, I know I'm confusing you now...planes...foreshortening...proportion...yea, it's a jumble - and this is THE most difficult part of drawing: where perspective, proportion, light and shadow - where they all meet. And they all meet right here in Suzy's picture. Lets get down to understanding some terms here - and lets do it by example (I know I'm getting long-winded again ;-). - Now, still with your right eye open, move the pencil slowly back and forth towards your eye. to get a grasp of. base lies in alignment with the sagittal plane. right where the base of the nose would rest. on the other side (the dotted line suggests that far half). nose just a tad towards the viewer - toward you, I should be flogged! I think it's very, very good). you OUGHT to be seeing - that is the great and simple trick to drawing. (r-mode) will be as natural as holding a pencil. courage - you're a true sport and real trooper. Keep up the fantastic work!